Citation Information: J Clin Invest. 2016;126(8):2855-2866. https://doi.org/10.1172/JCI86610. Hypertriglyceridemia is an independent risk factor for cardiovascular disease, and plasma triglycerides (TGs) correlate strongly with plasma apolipoprotein C-III (ApoC-III) levels. Antisense oligonucleotides (ASOs) for ApoC-III reduce plasma TGs in primates and mice, but the underlying mechanism of action remains controversial. We determined that a murine-specific ApoC-III–targeting ASO reduces fasting TG levels through a mechanism that is dependent on low-density lipoprotein receptors (LDLRs) and LDLR-related protein 1 (LRP1). ApoC-III ASO treatment lowered plasma TGs in mice lacking lipoprotein lipase (LPL), hepatic heparan sulfate proteoglycan (HSPG) receptors, LDLR, or LRP1 and in animals with combined deletion of the genes encoding HSPG receptors and LDLRs or LRP1. However, the ApoC-III ASO did not lower TG levels in mice lacking both LDLR and LRP1. LDLR and LRP1 were also required for ApoC-III ASO–induced reduction of plasma TGs in mice fed a high-fat diet, in postprandial clearance studies, and when ApoC-III–rich or ApoC-III–depleted lipoproteins were injected into mice. ASO reduction of ApoC-III had no effect on VLDL secretion, heparin-induced TG reduction, or uptake of lipids into heart and skeletal muscle. Our data indicate that ApoC-III inhibits turnover of TG-rich lipoproteins primarily through a hepatic clearance mechanism mediated by the LDLR/LRP1 axis. 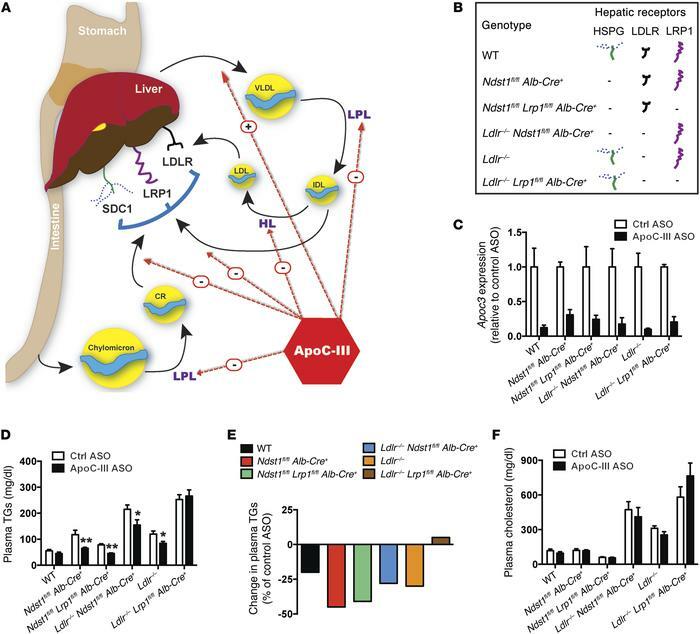 ApoC-III ASO–mediated plasma TG reduction in mice on a chow diet depends on hepatic LDLR and LRP1. (A) Schematic overview of the possible effects of ApoC-III on TRL metabolism. (B) Mutant mice and their representative expression of hepatic TRL-clearance receptors HSPG, LDLR, and LRP1. (C) Liver expression of Apoc3 in mutant mice treated for 4 weeks with control or ApoC-III ASO (n = 3–7/group). (D) Fasting plasma TG levels in mutant mice treated for 4 weeks with control or ApoC-III ASO (n = 5–10/group). (E) Relative changes in plasma TG levels induced by ApoC-III ASO in mutant mice. (F) Fasting plasma cholesterol in mutant mice treated for 4 weeks with control or ApoC-III ASO (n = 5–10/group). Values represent the mean ± SEM. *P < 0.05 **P < 0.01 compared with control ASO-treated mice. ANOVA with Bonferroni’s post-hoc test. Ctrl, control; HL, Hepatic Lipase.